Bong Barnstormed the Aerial Bridge? Many people think World War II Ace and local hero Richard A. Bong barnstormed Duluth’s Aerial Lift Bridge during World War II. 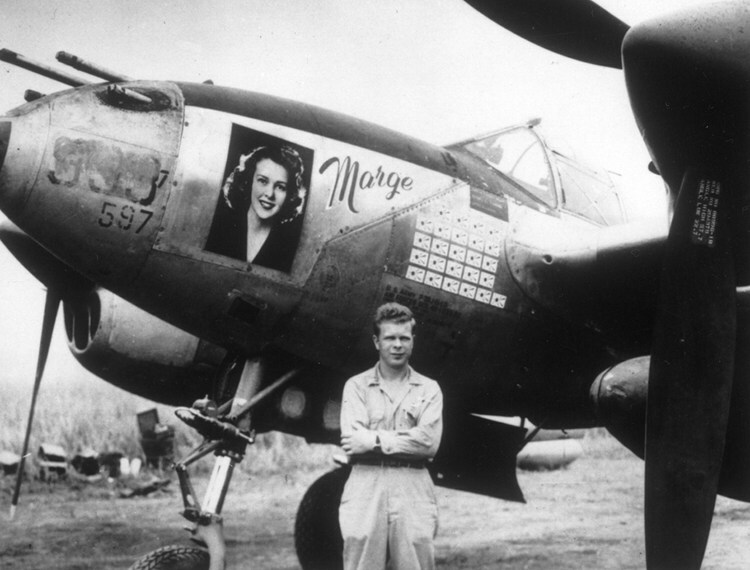 Bong, a native of Poplar, Wisconsin, shot down forty Japanese planes while flying his beloved P-38, nicknamed “Marge” for his wife. In 2006, John Hoff told a reporter he witnessed Bong take his P-38 through the bridge in 1944. Hoff was eleven years old at the time, visiting his father’s office in the Alworth Building. He swears he saw a P-38 fly in low from the east between the canal’s piers and emerge west of the bridge. Unfortunately, no one else saw it. Roy Mahlberg of Duluth told the newspaper he remembers the Duluth News-Tribune’s headlines the next day and a photo of Bong’s P-38 flying under the bridge. But no newspaper account of Bong flying his plane through the bridge exists, nor any photos. Bong certainly was capable: he once flew a loop-the-loop under and over the Golden Gate Bridge. Since 1919, several people have flown airplanes beneath the top span of the aerial bridge. You can read about them here.